Stunning and Strong—the Roosterfish is the Main Prize Here! This vacation is made for anglers looking for a real fight. 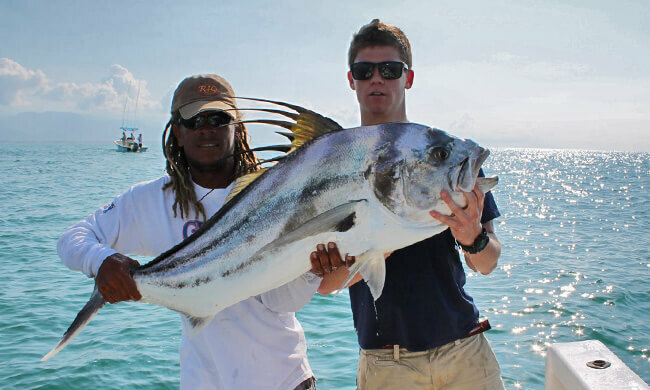 Roosterfish is a strong game fish with a feisty attitude and are the big prize for inshore anglers due to their hard fighting ability, beautiful colors, and giant comb-like dorsal fin. If you fish near the rocky islands and reefs for this game fish with the attitude of a middle linebacker. Once hooked, this brazen and macho fish will try, and actually might be able, to out muscle you. Commonly found around rocky outcrops and islands, they are also caught hunting right behind the surf. Roosters can be hooked with poppers and spinners, though they go crazy for live bait. 3 full-day inshore fishing tour. Fish from sunrise to sunset! Exclusive Airport ‘Meet and Greet’ service. We’ll greet you off the plane and help you through customs. Although roosterfish is definitely a predatory species between the 20-40 lb range, you are bound to find 50 lb specimens almost every month. Ah, and the sight of double digit numbers of roosters is something to admire! Arrive into San José, Costa Rica. Our “Meet and Greet” staff will meet you inside the airport and take you to your private transfer. 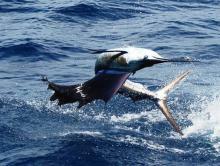 From there we’ll take you down to the sportfishing capital of Costa Rica, Manuel Antonio. 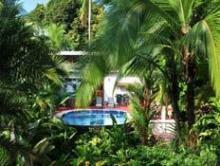 Your hotel, The Falls Resort, offers a serene setting in the midst of the tropical rainforest. Dine in the best restaurant in the area while you admire the hotels immense flora and fauna. Are you ready for your first day of fishing? 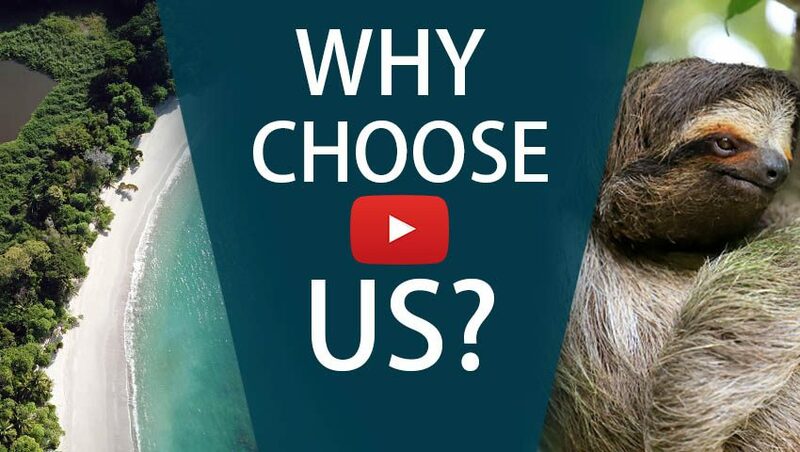 You’ll fish with the best inshore guides and anglers in Costa Rica. Troll with live bait and wait for the reel to scream! Head out early in the morning for another day full of roosterfish! Pepsi will have the live bait ready so if you missed out the first day, here is your second chance. Take this day off to relax, rest your arms, and see what else Costa Rica has to offer. 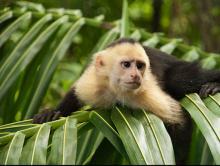 Manuel Antonio National Park is nearby! Go for a walk and admire the park’s abundant wildlife and three gorgeous beaches. Head back out the Central Pacific coastline for another day of light tackle fishing. Roosterfish love to make a second run when you get them close to the boat, so be prepared to fight back! You can go after one of our other in-shore species like snapper, barracuda, mackerel, and sea bass. Enjoy your last day in Costa Rica, you’ve earned it! 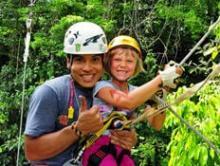 Today you’ll do the famous canopy zip line tour. This tour includes a tilapia farm, butterfly garden, 14 cables, and the Tarzan swing! We will pick you up and take you to the Quepos Airstrip so you can board your 25-minute domestic flight back to San José. Understated and comfortable, with modern amenities and resplendent gardens, The Falls is suitable for families and couples looking for a little oasis just a few minutes from the area’s famous beaches and national park. Travel across the forest suspended by cables. While you feel the adrenaline rush, try to make sure to be on the lookout for exotic animals like titi monkeys, poison dart frogs, and toucans!